Posted October 21, 2016, in Practice News. 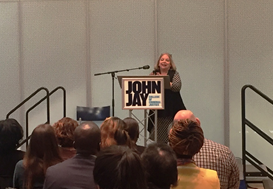 NRCCFI Director Ann Adalist-Estrin helped the Osborne Association kick off the See Us Support Us Campaign in New York on October 5 by giving an address at John Jay College of Criminal Justice entitled “Guiding Principles for Responding to Children and Families of the Incarcerated “One of those Guiding Principles was Honor the Resilience in children and families of the incarcerated. In the hundreds of focus groups and listening sessions that NRCCFI has participated in over the last 3 decades, youth with incarcerated parents speak clearly about their need for the people around them to see their pain but not to forget their strengths. Last week the See Us Support us Campaign focused on that resilience and strength. The Osborne Association https://www.osborneny.org/ Alameda County Children of Incarcerated Parents Partnership http://accipp.org and the San Francisco Children of Incarcerated Parents Partnership https://www.sfcipp.org/ have collections of Resiliency Stories on their web sites. Please visit them and hear the stories of triumph and strength. Children with incarcerated parents have to cope with many and varied problems such as being separated from their parent, compounded by stigma and labeling. This stigma and labeling is sometimes even part of the narrative that is used to promote support for children and families of the incarcerated. In order to bring attention and resources to this issue, we see press releases and news stories and even program brochures and web sites that describe the risks and negative outcomes associated with parental incarceration. Instead of viewing the children as damaged or harmed or potentially becoming their parents, let’s shift the narrative and begin to view them as strong unique individuals that are going through hard times, must overcome many obstacles but also have strength, resiliency and hope for their future. Resources on Resilience for children and families of the incarcerated are scarce. One of the only studies focused on resiliency for children of the incarcerated is Kate Luther’s 2015 article Examining Social Supports Among Adult Children of Incarcerated Parents) This study examines the risks and protective factors of 32 college students who had an incarcerated parent at some point in their childhoods. Parental incarceration is related to many challenges and risks, yet we know little about resilience among this population. This study examined how social support contributed to the resilience of a sample of adult children of incarcerated parents. In-depth qualitative interviews were conducted with 32 college students who had experienced parental incarceration during their childhoods. Social support from caring adults, including caregivers, incarcerated parents, grandparents, older siblings, teachers, and coaches helped facilitate success in light of parental criminality and incarceration. In particular, these adults promoted resilience in 3 ways: (a) providing access to conventional activities, (b) supporting a vision of a better life, and (c) encouraging turning points. Implications for those who work with children of incarcerated parents are discussed. Although Denise Johnston and Megan Sullivan’s new book is not focused on resilience, it is unique in the literature because it goes beyond focusing on the period when parents are actually in jail or prison and examines the developmental impact of children’s experiences that extend long beyond that timeframe well into adulthood. There are also some amazing stories in this book and examples of strength and triumph over the risk and adversity. In one of those stories, Daniel B. looks at the incarceration of his father through the lens of his reentry. His story also includes his mother’s arrest for a DWI and a period of foster care for him and his sister. This story began with incarceration and led to a reentry journey for the entire family. It highlighted reckless choices alongside commitment to parenting and respect for the family. It led Daniel to do well in school, go to college and law school. My father was released from custody and put on parole in 1985. I was only a few months old at his homecoming. I have no recollection of his incarceration or the years right after his release. Our collective struggle to move beyond my father’s felonious past has been, I believe, the most defining aspect of who we are as a family. As is often the case, the long and destructive reach of the collateral consequences of his criminal record, impacted not just our access to resources and opportunities, but also how we viewed ourselves and our place in the community….I am a civil rights attorney and practice exclusively on matters related to reentry…I was at Polk (Correctional Institution) to discuss barriers to reentry and potential legal relief as part of a seminar the men between the ages of 19 and 25 were participating in…Looking out into that crowd of youthful faces, I was besieged by feelings of pride, sadness and shame. Alongside these emotions, though, was the prevailing sense of resiliency that still defines our family. This volume is focused on resilience in young children. It includes an emphasis on attachment, the development of empathy, peer relationships and the importance of parenting in the development of resilience. It reminds us that supporting the relationships between children and their incarcerated parents is often critical to the well- being of children of the incarcerated. ‹ Previous: The National Institute of Corrections Published a New Guide on video visiting authored by The Osborne Association. This page was printed from http://nrccfi.camden.rutgers.edu/2016/10/21/shifting-the-narrative-see-us-support-us-month-continues/ at 7:58 PM Monday, April 22, 2019.